dance.net - MADE LATE FEB 16 Stunning Dance dress to suit a Tall 11 year old. IMMACULATE CONDITION. (10241670) - Read article: Ballet, Jazz, Modern, Hip Hop, Tap, Irish, Disco, Twirling, Cheer: Photos, Chat, Games, Jobs, Events! 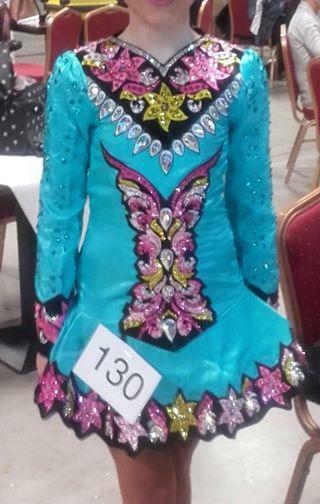 MADE LATE FEB 16 Stunning Dance dress to suit a Tall 11 year old. IMMACULATE CONDITION. Beautiful uniquely designed dress, in excellent condition. Made late Feb 16 & hasn't been worn or will be worn through August at all. Absolutely stunning on stage & can only be seen how actually gorgeous it is, in person. Stunning dress for a v tall 11 year old. Selling due to growth spurt. Full length shoulder to hem front 28.5"
V in neck to hem front 26"
Sleeve from top of shoulder to hem 22"
Shoulder to shoulder across back top 10.5"
Shoulder to shoulder across back underarm 12.5"
Top of zip to hem back 29"
There is at least 2.5" throughout for adjustments. AVAILABLE 2ND WEEK IN SEPTEMBER.